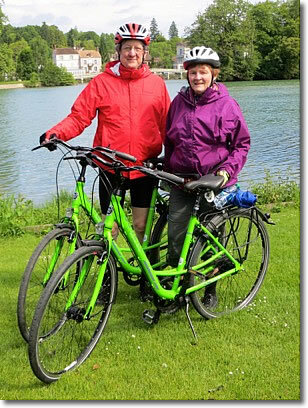 Beautiful scenery, picturesque villages, verdant forests, placid rivers and respectful drivers—bicycle touring in France is a wonderful way to see the country. Bicycling in France has been a popular sport for more than a century. Indeed, the vélocipède was used in France as early as 1816, the very word bicycle was coined in France in 1860, and Paris was the first major city to offer free bicycles (Velib') to its inhabitants. French drivers are used to seeing bicyclists on city, town and village streets, on country roads and even two-lane highways. Most drivers are accommodating to cyclists and will share the road if you know and observe the Rules of the Road and show that you ride with confidence, like you know what you're doing. If you lack confidence and don't appear to know how to ride and follow the system, a driver will not know what to expect from you, and there may be confusion, or worse. 1. Know, understand and obey all traffic signs and signals just as if you were driving a car. Stop fully at stop signs, stop for pedestrians in crosswalks, don't ride the wrong way on one-way streets, etc. 3. 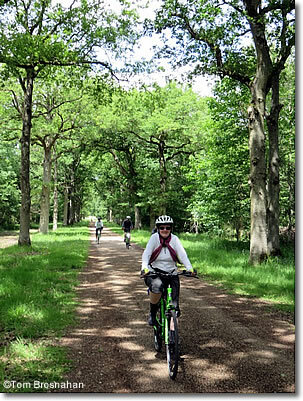 Ride on bike paths, not roads, whenever they are available. When riding on streets and roads with other bikers, ride single file on the right-hand side of the road, staying close to the road edge. 4. IMPORTANT! When riding with others on roads with two-way traffic, leave spaces of 15 meters (50 feet) between bikers so that a car passing a biker can move back in line if a vehicle comes from the opposite direction. Motor vehicles can thus leapfrog safely along the line of bikers to the front. The concept of driver priority (priorité) is more elaborate and important in Europe than in some other parts of the world (including the USA). To drive or ride safely in France, you must understand and obey its rules. We all know that traffic moving along a road has priority (right-of-way) over traffic stopped at a STOP sign and waiting to enter the road, but there are many situations that are not so clear, and the rules are less well known. Who has priority? In the top sign, you do. In the bottom sign, the other vehicle does. If a street, road, bridge or tunnel is too narrow for two vehicles to pass at the same time, there may be signs indicating priority (that is, who gets to go first). 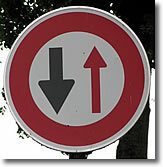 The sign has a larger arrow in one direction and a smaller arrow in the other direction. 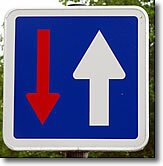 The larger arrow shows priority. If it is pointing in the direction you are going, you have priority. If not, you must yield to a vehicle approaching from the opposite direction. At road intersections, if there is no sign or signal (such as a STOP or YIELD sign) or a traffic signal dictating priority, the car to the right has priority (priorité à droite). Roundabouts (traffic circles, rotaries), called rond-point in French, are very common on French roads. Traffic moves counter-clockwise (anti-clockwise) around the circle, and vehicles which have already entered the roundabout have priority. When you approach the roundabout, you must stop and yield before entering. When there is no traffic coming from your left, you may enter the roundabout. Ride along the outer edge of the roundabout, signaling your intentions: signal a left turn as long as you are in the roundabout to indicate that you are continuing around it, then a right turn just before exiting the roundabout. Other vehicles will watch you and yield to you as you are in front of them and have priority. Vehicles waiting to enter the roundabout will yield to you as well. Navigating busy roundabouts with cars and big trucks whizzing around can be daunting, but if you know and follow the rules and have confidence, other drivers will also follow the rules, know what you are doing, will yield to you, and you'll ride through just fine. 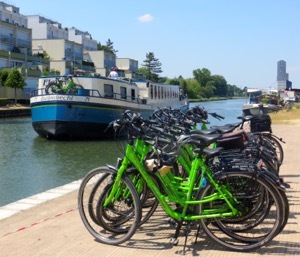 From marked bike lanes in big cities and small towns to verdant bike paths along rivers and canals and through parks and forests, France is covered in bicycle paths, making travel and touring by bicycle much safer and more pleasant. If you are a pedestrian, you must be aware of bike paths and not walk in them unless they are meant for sharing. Sometimes pedestrian and bike lanes are separately marked on a path so that bikers may ride unimpeded and pedestrians may walk in safety. near the Seine south of Paris. 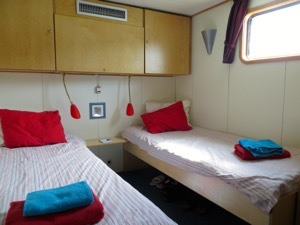 Above, Comfortable cabin on the Fleur. Taking a break on the Seine after a morning's ride.